Need to make a mother’s day cake tomorrow. In Sweden, it’s mother’s day tomorrow and if you haven’t already planned your mother’s day cake it’s time now. I’m going to give you the easiest recipe ever. You can’t fail with this, I promise. It’s even child-friendly – as in even your kids can do it. Because let’s be honest, as a mother myself it’s wonderful to get a treat that is not made me. As much as I like baking everything from scratch, I realise not everyone wants to do just that or has the time to bake a Mother’s day cake from scratch. This cake is one of those good cakes to make for any occasion really. It is that quick and simple. 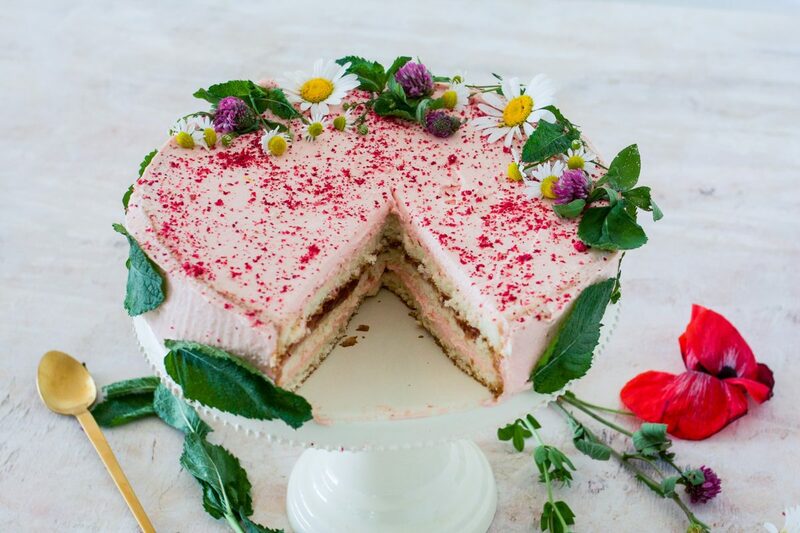 For this cake, I used mint leaves and seasonal eatable flowers that you can easily find outside. They grow pretty much everywhere outside where you can find wildflowers. I picked clovers, chamomile and daisies. It’s very pretty and the effort of picking your own flowers will be much appreciated. Just make sure there are no bugs or such on them. If you want to add a little more flavour and “realness” to your strawberry mousse. Try adding whipping cream and dried strawberries. It will taste a little creamier and more strawberry like. Or slice the strawberries in thin slices and add them on top of mousse filling. If the store bought cake rounds are little too dry, brush them lightly with a mixture of vanilla, icing sugar and water. 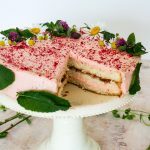 A super simple strawberry mousse cake that is done in about 15 minutes. Start by mixing the strawberry mousse powder with the milk and let it sit while you beat the whipping cream. Mix the whipping cream with the strawberry mousse and cover the bottom cake sponge. Add the dried strawberries and mix it together. Place the middle sponge on top of the bottom one. Spread the lime curd on the top and the spread the strawberry jam on top of it. Place the last sponge on top of the middle one and cover with the remaining strawberry mousse. 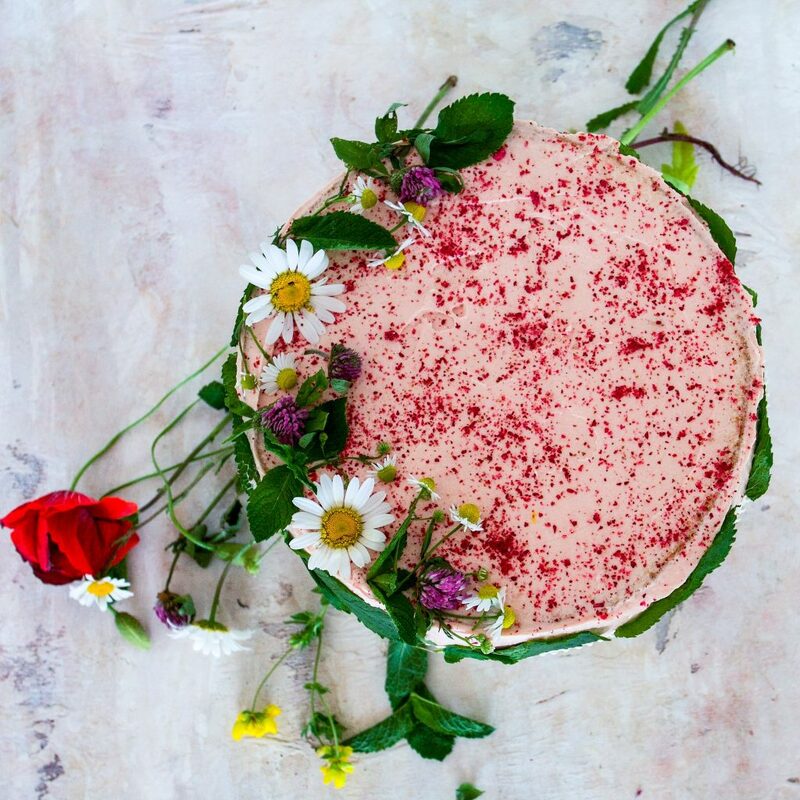 Cover the whole cake with a spatula and decorate with fresh flowers. On the other hand, if you want to make your own cake, you can make these coconut sponges instead. The strawberry and coconut marry well. And if you want to make your own cake filling you can check out the recipe for this chocolate cake. If you want to make something easy but still do it from scratch these bakery style raspberry muffins will get you at least a hug and kiss. Either way, happy Mother’s day to all you wonderful mama’s out there! Hope that’s ok for you and I also mentioned you below with this link, you deserve it 🙂 !